With the best scenes and pulls from Indoorpulling in Holland, the German Championships, Euro Cup finals and the exciting American pullingevents like Super Nationals at Bowling Green, Grand and State National Pulling. It features all Pulling Classes with great footage of all American Pullingstars and best Race-Tractors on Earth. Also lots of teamreports and interviews like from Roberts Pulling Team, Green Monster, Lambada, LeCoiffeur, Red Painter, MF-Brutal Force, Silver Bullet reloaded, Crazy Canuck V8 IH-SS, The General Turbine, Rat Poison Unlimited Mod and more. 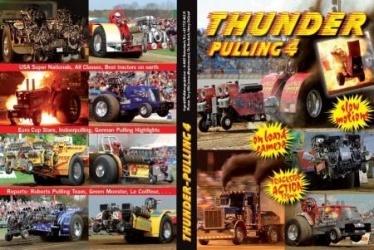 “Thunder Pulling 4” – that`s Tractor Pulling at its finest, as you would be live on the track. “As usual, Gerald did a hell of a nice job catching great impressions of the past Pulling Season. He was shooting at Ahoy / Netherlands, Füchtorf / Germany, Herbertsfelden / Germany, Euro Cup Finals Bettborn / Luxembourg, Bowling Green, OH / USA, and several RN and GN events in the USA.